The weight of the rockhopper penguins is 2.3 kg to 2.7 kg. The females are slightly smaller in size as compared to males. These species are 52 cm long. Rockhoppers are capable to dive 100m deep into the water. 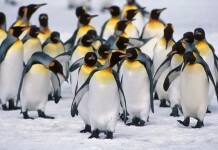 These species are believed to be the most aggressive birds amongst all the penguins. They are extensively distributed all over the islands including Antarctic Polar Front and Southern part of the Atlantic and Indian Oceans. As far as the breeding facts are concerned, these species have the same biology as that of other royal or Galapagos penguins. Unlike other penguins, the breeding season of these birds does not last too long. Females lay 2 eggs out of which second egg usually comes up with a chick. The males come back to their colonies in the month of October and November while females return afterwards. After their return to the colonies, they tend to rebuild their nests altogether. While females incubate (keeping warm) eggs, males usually go out in search of food and return after 1 month period. Females go by these days without food. The normal time when the chicks fledge comes in January. 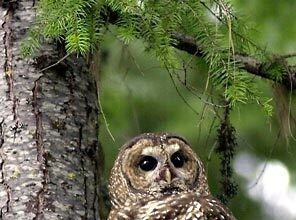 The breeding colonies comprise of more than 100,000 nests. Breeding starts from the day when the female lays 2 eggs in 4 days period. The incubation period lasts from 32 – 34 days. The clutch comprise of 2 eggs. On the negative side, the population of rockhopper penguins has been reported to decline more than 90% in different islands such as Falkland, Antipodes and Campbell Islands. 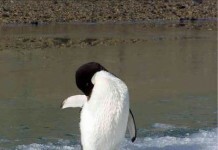 One of the possible causes of this decline is the significant increase in the islands’ temperature due to which it becomes difficult for these penguins to hunt out their prey. Increasing global warming is mainly responsible for the added temperature. In the Macquarie Island, a rough estimate of rockhopper’s population counts to 100,000 to 500,000 species. The prime diet of these birds consists of fish, krill, squid, euphausids, and myctophid fish. During the breeding season; however, the diet turn out to be lesser as against normally. They eat greater quantity of fish in comparison to the royal penguins. These species are the migratory birds; in that they leave islands in the breeding season. When it comes to the size, rockhopper penguins can be easily identified. 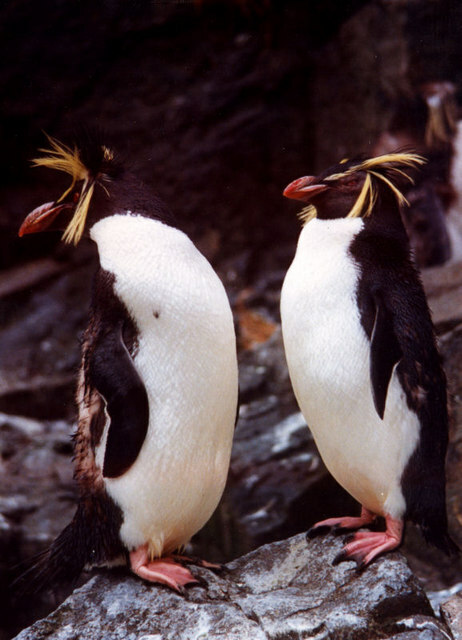 As against the orange plumes, rockhopper has yellow feather plumes. They can be distinguished through their red eye. They produce sound which is notably different from other species. The chicks of most of the penguins are same in size and color; therefore, not an easy to make a distinction amongst them. These birds mostly build their nests on the rocky slopes and small caves in order to devoid sunlight. They tend to protect eggs by placing them underneath the ground or in the pile of rocks. Normally, initial eggs do not produce chicks and if they do, juveniles die too early. These are one of the smallest species of penguins and belong to the group of Eudyptes Chrysocome. Southern Rockhopper penguins live in the subantarctic islands including Pacific and Indian Oceans. These species belong to the genus Eudyptes. The weight is 2 – 3.4 kg (4-4 – 7.5 lb). The maximum weight of these species is 5 kg (11 lb). The southern rockhoppers are basically black and white. The average lifespan of southern rockhopper penguin is 10 – 20 years. 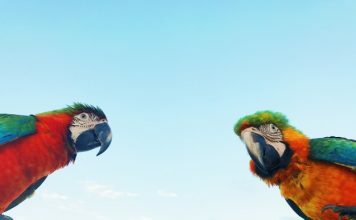 The estimated population of these birds is about 7.3 million around the globe. 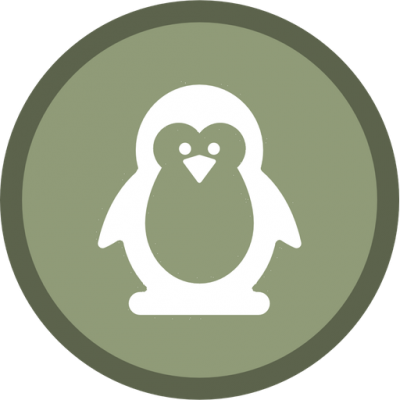 Where do Southern Rockhopper Penguins live? Southern rockhoppers are globally distributed with a population of more than 1,000,000 breeding pairs. 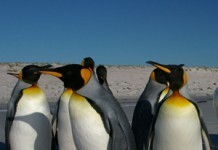 They usually breed on Falkland Islands together with Chile and Argentine Islands. Other Islands include Prince Edward Islands, Crozet Islands, Antipodes, Diego Ramirez Islands, Kerguelen Islands, Heard Islands, Campbell Islands, and Auckland Islands. The primary feed of these birds include lantern fish, krill, squid, cuttlefish, octopus, crustaceans and mollusks.